I’m no expert, but I’m pretty certain this wasn’t the best course of action. You can’t knock the stabber at all in this situation. If someone has the audacity to challenge you to stab them when you were ultimately planning to stab them you, um, have to stab them. All of your credibility as a mugger flies out the window the minute you don’t stab this dude. 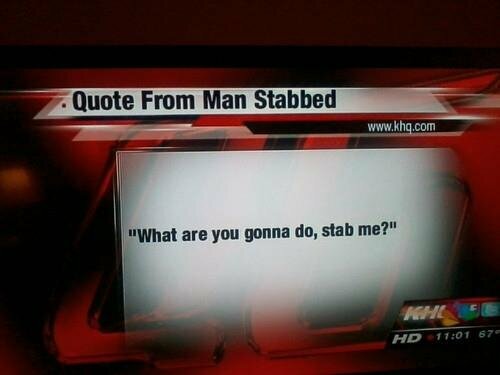 With that said, the guy that got stabbed might be the dumbest dude in the game. Probably watched too many sitcoms and was waiting for the laugh track to bail him out. Nope, you were wrong and now you’re bleeding out.